The 49th edition of KEI week has kicked off this Monday: Once upon a KEI. 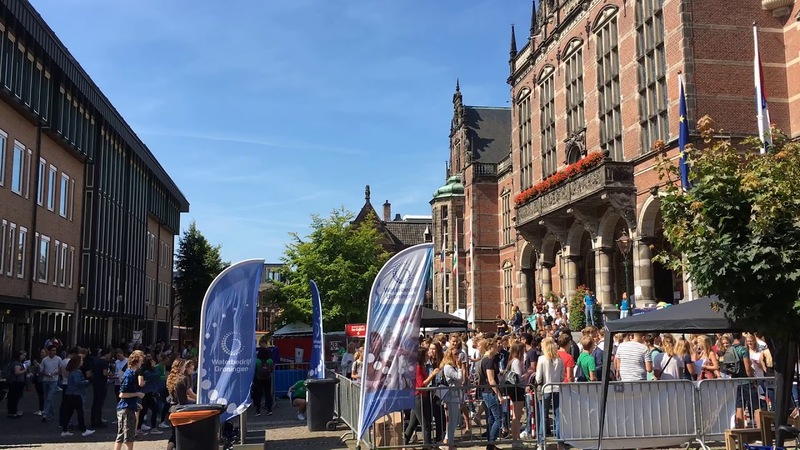 During KEI week, first-years are introduced to everything that Groningen can offer them in the area of studying, sports, culture and nightlife. On Monday morning, the Academieplein was bursting with students registering officially for KEI week. This was the starting point for five days of events designed to give first-years a taste of all aspects of the city and student life. After registration, KEI students can move on to the information market on the Vismarkt. This is where the various student organizations will present themselves. First-years can get help looking for a room, and even the police will be there to provide information about secure student digs. Tuesday is also all about preparing well for student life. Martiniplaza is hosting workshops and lectures in the field of studies and work under the motto ‘KEI to your Future’, including by famous ex-UG student Arjen Lubach. KEI students will get tips and advice on how to study effectively, how to apply for jobs and be active alongside their studies. Wednesday will concentrate on sports and culture. In the afternoon, the sports clubs will give presentations at the ACLO Sports Centre, and students will be able to try out various sports. In the evening, students can follow workshops organized by cultural societies during ‘More to Explore’ in De Oosterpoort. Bands and cabaret artistes will also perform. Sustainability is an important aspect of the Open Air Festival to be held on Thursday in the Stadspark. A ‘Green Corner’ has been set up at the Festival for various sustainable initiatives and activities. Last week it was announced that this year’s KEI has been awarded the Green Key standard, which is awarded to events that are consciously environmentally friendly and thus go above and beyond the relevant legislation. For example, all the power units at the Open Air Festival will run on organic fuel. In 2014 and 2015, KEI also won the prize for the most Sustainable Introduction Stunt (DIS, Duurzame Introductiestunt ). KEI week is the general introductory period for all new students in Groningen, WO and HBO. About 5,000 Dutch and international students are expected to take part. It is not only the largest introductory period but also the oldest introductory week in the Netherlands – it was first organized in 1969! Last modified: 24 May 2018 10.51 a.m.